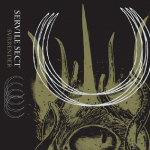 “Servile Sect is, inevitably, birthed from some genre-specific formula of influence and the parallels are, at times, easy to draw. What elevates their music above and beyond the coils of compartmentalization and inhibited thought is not easy to isolate. Trvth is a monument in its own right. 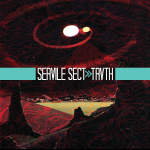 Weaving together a vast canvas of influence that begins with psychedelics, passes the cosmos and lands in the wilderness of self induced free thought – Servile Sect are large in vision and large in sound. Surpassing the rudimentary hallmarks of ambience, noise, psychedelic hues, drone and black metal (all lazy comparisons when it comes to the blitzed euphoria that lies at the center of these drones and rhythms) to birth one of the most unique and intriguing records of the year. It can be hypnotic – but certainly not solely because of the psychedelic cadence that permeates the field recordings, for the black metal movements of the song are equally hypnotic. It can be euphoric – though not due to the crystalline clarity that seeps through during moments of climactic intensity, since the shuffled, fuzzed and meandering field recordings are light-bearing enough. It can be aggressive – the relentless ‘solar storm’ assault that out shadows the majority of the second side is justification enough. Yet to hint at this during the more relaxed, trip inducing first side? How can this even come to be? “Released as a cassette-only companion to the group's recent Trvth record, also released on Handmade Birds, Svrrender acts perfectly as an extension of Trvth, building on the band's sprawling blackened psychedelia and scorched blackbuzz drones. The record opens with sheets of thick buzzing synths, and swirling electronics, all over strange murky pulses, and laced with strange disembodied voices, before launching into a full bore blast of traditional sounding black metal fury, huge thick squalls of barbed riffage, programmed beats blasting wildly through the murk, the vocals a sick, raspy demonic croak, a blur of chaotic blackness, that manages to meld traditional BM tropes to something much more mysterious and experimental, the group infusing the seemingly traditional sound with all manner of unlikely texture and subtle warped FX. Definitely grim enough for unadventurous metalheads, but as this is Servile Sect, the sound soon shifts to something much more spacey and droned out, total psychedelic cosmic drift, thick undulating swells of crumbling rumbles and sci-fi shimmer, wrapped around chantlike vox and smeared layers and textures, and over the course of the five songs on the A side, the sound veers from that droned out celestial thrum to furious churning black metal blasts and back again, the whole side a dizzying twisted black/drone juggernaut.